Janet Testerman is a Knoxville native, and before joining Young-Williams Animal Center as CEO, she spent nearly a decade in internal communications with Scripps Networks Interactive and earlier with E.W. Scripps’ as executive editor of custom publications, Knoxville Magazine and skirt! Magazine. Janet has served on numerous boards including Knoxville Tourism & Sports Corporation (now Visit Knoxville), Bijou Theatre, Leadership Knoxville and Young-Williams for five years prior to joining the organization full time. She is also immediate past board president of Dogwood Arts. She earned her BA in Communication from Southern Methodist University and MA in Strategic Communication from American University. Janet resides in Knoxville with her husband, Joey Creswell, and 13- and 15-year-old stepdaughters, Georgie and Elie. And when she’s not catering to the needs of her Golden Retriever/Corgi mix, Buddy, and rescue Dachshund, Lollie, you can find her enjoying Knoxville’s great arts and food culture as well as bringing her passion to many of the community’s great causes. Boudreau joins Young-Williams Animal Center with more than 15 years of nonprofit experience with 10 years spent at the Humane Society Silicon Valley (HSSV), where she served as director of intake, behavior and adoptions. During her time at HSSV, Boudreau increased adoptions by 56 percent without an increase in the adoption return rate. In addition, she increased rescue intake of animals from other shelters by 200 percent. Boudreau also launched community programs, including the opening of two “Neighborhood Adoption Centers” and implementing a community cat management program utilizing trap-neuter-return (TNR) methods. Barry Rivers began working for Young-Williams Animal Center in 2008 after a 12 year career in Hospitality Management. He is a dedicated animal lover and an advocate for Type 1 Diabetes. Barry lives in Strawberry Plains with his wife Amber, 2 children, 3 dogs and 3 cats. Dr. Lisa Chassy is originally from the Washington DC area, and is a 1994 graduate of the University of Illinois College of Veterinary Medicine. She moved to the Knoxville area in 1995, and quickly became involved in animal welfare. She has worked for YWAC since 2005. Dr. Michele Franco started working with Young Williams as a part-time veterinarian on the Young-Williams Spay Shuttle. Michele comes from a large family where her mother was a prime influence for all the family pets being spayed and neutered. It was a lesson that led to a passion after Michele graduated vet school. Michele now works full-time with her Young-Williams family in the vet clinic. When she is not at work you can find her volunteering in Knoxville with other homeless pets at VPHO and Feral Fixin’ events. When not working or volunteering, Michele loves spending time with her family, especially her husband and six dogs at their farm in Kingston. Jen Reed is a Kentucky native who moved to Knoxville in 2010 after earning a degree in Music Education. She began working at Young-Williams Animal Center in 2012 and realized her true passion: working to help save homeless pets. Jenifer resides in the Fountain City area with her husband, Ryan, two Brittanys, Tegan and Gabriel, and Peter the cat. Jessie started out at Young-Williams Animal Center in 2004 as an animal care attendant. Since then he has been involved with the organization through a few different roles. He was an animal control officer, intake specialist and has recently taken on the role of Animal Care Manager. His passion in life has always been to help lost and homeless animals. All of his animals have been rescued. He has a Chihuahua/Boston terrier mix named Ellie who is an alum of YWAC. Jessie and his family have seven horses, a Green Cheek Conure and three aquariums. In his spare time Jessie spends time with his wife and three children, rides his motorcycle and enjoys the beauty of the East Tennessee mountains. Brandy Ellison’s passion for working at Young-Williams Animal Center started on her first day as an employee in 2005. Since that time she learned the ins and outs of what is involved in animal welfare. In 2008 she temporarily left to raise her four sons, but she came back in 2013 to continue her important role in the animal welfare of our community and has since stepped into her role as Placement Manager. If she’s not placing animals with rescues or foster homes, Brandy can be found cheering on her boys at their various sports games, reading a book or educating herself even further on animal welfare. She shares her home with a Chihuahua/Boston Terrier mix named Eleanor that she and her family adopted from YWAC, and a Cockatiel named Thunder Chicken who is always whistling, singing or talking. After 34 years as a private business owner, Tammy retired from the business world to fulfill her lifelong passion and goal of working with animals. 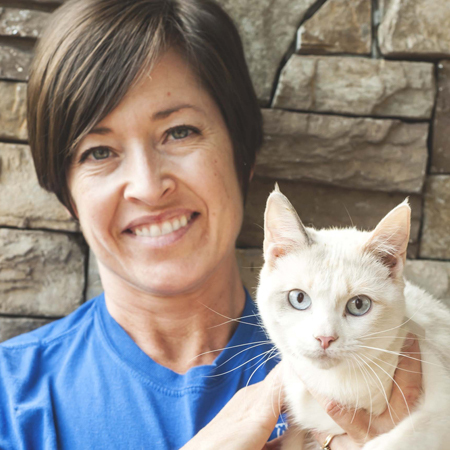 Since 2012, Tammy, a native of Knoxville, has been managing Spay/Neuter Solutions at Young-Williams Animal Center. Tammy is the proud mama of Lilly, a spirited and loyal golden retriever, who often accompanies her wherever she goes. In her free time Tammy enjoys culinary adventures, art, traveling (preferably the east coast) and reading books on history. Sophie Nguyen officially joined the Young-Williams team after 3 years of volunteer fostering. She has a Bachelor of Science degree in animal science and a Bachelor of Arts degree in psychology from the University of Tennessee. Her background includes working with local non-profits and a personal interest in animal welfare. She has a wonderful husband and 3 cats. Matthew moved to Knoxville in 2005 to launch an equestrian training program and fell in love with the area and the people. Born in Sarasota FL, he lived in NC for High School and college before making his way to Tennessee. Matthew is an avid outdoors-man and can often be found at the farmer’s market, Mead’s Quarry paddle boarding with his dogs, supporting local events, or riding his horses. As an equestrian professional, his specialty has been finding his clients the perfect horse. In his new position he looks forward to finding the perfect home for every pet, being involved with the Knoxville community and being a part of the team at Young-Williams. Stephanie started working at Young-Williams Animal Center in the Fall of 2012 as an Intake Specialist after moving back from Florida earlier that year. In Florida, she worked as a veterinary nurse at Ocala Equine Medical Center. She is currently the Intake Manager at Young-Williams, but can be found in any part of the facility on any given day. When away from the shelter, Stephanie enjoys the gym, her garden, hiking, but mostly her cats! Hannah Overton began her journey with Young-Williams as a volunteer in 2013. After two years she began photographing the adoptable animals, and she has not stopped since. Hannah has a Bachelor of Arts in English Literature from the University of Tennessee, almost ten years of experience and training in the art of photography, and a passion for animal welfare that lasts a lifetime. In her spare time she can be found enjoying The Great Smoky Mountains, cuddling with her cats, reading a good book or creating art. After 18 years of retail management, Marjorie decided to make a complete career change and enter the field of animal welfare. After she quit her retail job she began volunteering at Young-Williams Animal Center. She was hired a few months later to work on the mobile unit for Spay/Neuter Solutions as a vet assistant and hasn’t looked back! In her free time she enjoys hanging out with her two kids, two dogs, two cats and three chickens! Shaver earned a bachelor’s degree in business administration with a concentration in management from Strayer University, and she currently is pursuing an MBA in business management at Strayer. She joins Young-Williams Animal Center with more than 25 years of experience in finance and business administration. Most recently, Shaver served as vice president of strategic projects and finance for VMC Facilities, LLC, in Knoxville. Damon McKenna has 21 combined years of experience working as a Veterinary Technician, Humane Society Shelter Manager and Arctic Wildlife Rescue Officer in Barrow, Alaska. With the exception of living in Alaska for a little over a year, Knoxville has always been home. When not at work he can be found hiking, spending time at the bookstore, traveling or going on one of the many never ending adventures with his sometimes-too-cleverly-intelligent, awesome and beautiful daughters. He is forever in love with Irish culture, history and language, spending time in our Great Smoky Mountains and all things Appalachia. Emily Inman has been with Young-Williams Animal Center since 2011 and has always had a love of and fascination for animals. Before taking on the role of Enrichment Coordinator, Emily worked as an Adoption Counselor and an Animal Care Attendant. Her favorite shelter residents have always been the dogs with challenging behavior. In fact, she has adopted three of them: Arbor the Corgi/shepherd mix, Birdie the Aussie/retriever mix and Posy the Golden retriever/spaniel mix. In Emily’s spare time she enjoys spending quality time with her dogs, kayaking, reading up on dog behavior and finding new and innovative enrichment ideas for animals in the shelter. Stephanie Eastman-Vozar is originally from Flint, MI. She moved to Knoxville to join Young-Williams Animal Center from Bonita Springs, FL. She has 20 years of development, marketing and fundraising experience in nonprofit and business fields. Stephanie recently served the American Red Cross in both South Florida and Michigan regions as a Major Gift Officer and previously worked for the United Way and Palace Sports & Entertainment, handling corporate sales for the Detroit Pistons. Stephanie earned her Bachelor of Arts degree in marketing with a minor in music from the University of Michigan. Stephanie and her husband Troy live in Knoxville with their 13-year old rescued Finnish Spitz, Bella. They love to cook and watch sports (especially college football, Go Blue!). Stephanie loves to sing and can be found singing karaoke or making music with her bandmates. She has a passion for animals and lives out YWAC’s vision of a home for every pet every single day.